the fash pack: ¡por favor, que alguien me compre esta revista! Spanish Vogue’s March issue sets a new record as the biggest issue of Vogue ever published in the world. With a 1,006 pages, the magazine weighs 2.7 kilos, just short of 6 pounds. The magazine is 400 pages with a 606-page supplement devoted to the fashion collections, specially bound together. It surpasses the previous record, held by the September 2004 issue of American Vogue, which ran at 832 pages. 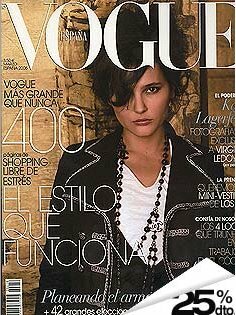 The main magazine of Spanish Vogue contains 175 advertising pages and the supplement contains 173 ad pages. Spanish Vogue is beating all of its competitors. The March issue of Elle, containing three supplements, has 688 pages and Marie Claire, with two supplements, has 336 pages. A local fashion magazine, Telva, sold with three supplements, comes to 564 pages. “Vogue is by far the biggest fashion magazine in Spain, and more importantly, it is the best,” Jonathan Newhouse, Chairman of Condé Nast International said. The editor of Spanish Vogue is Yolanda Sacristan, and the President of Condé Nast Spain is Javier Pascual del Olmo. enhorabuena to the staff is all i can say!!! Vogue Spain is the best fashion magazine in Spanish, for sure!